OMB, in collaboration with the Chief Acquisition Officers Council, Department of Health and Human Services (HHS), and the General Services Administration (GSA) is engaged in a multiphase, multifaceted approach that will result in recommendations to reduce reporting burden, standardize processes, and reduce costs for Federal awardees. While the recipient reporting for Federal contracts and grants are similar, there are reporting burdens unique to each. To gather recommendations for easing reporting for recipients of Federal contracts and grants, OMB is conducting the pilot with two primary focus areas. Test the portal by centrally collecting select FAR required reports that are currently reported across the Federal government, beginning with collection of reports required under FAR 22.406-6. The goal is to allow contractors doing business with the Federal Government to submit FAR required reports to one central location in an efficient and effective manner rather than multiple locations and to each contracting officer (CO). An overview of the procurement pilot focus, test models, and metrics is below. Contract award for tool development – complete. Link to FedBizOpps.gov for contract award information. Contractors who are required to submit under FAR 22.406-6 and are interested in participating in the pilot data collection tool are encouraged to share their information and interest via SpendingTransparency@omb.eop.gov. 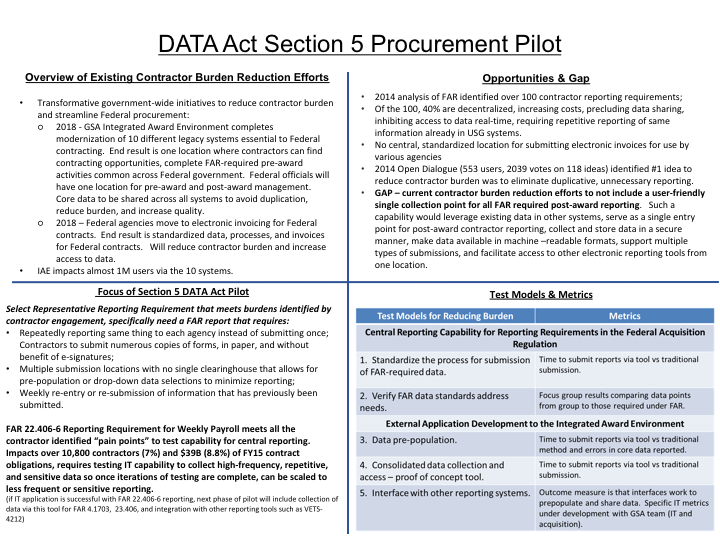 Acquisition community members can get updated information about the DATA Act Section 5 Procurement Pilot by following this link to GSA’s Integrated Award Environment (IAE) Industry Community.